The Francis Thompson Room in all its glory – in the center you can see the “Epic Poetry” stained glass windows while the bookcases on either side contain books by or about Thompson, his benefactors the Meynells and Coventry Patmore. This month, we’re welcoming you back on campus with posts about various projects – from cataloging to sesquicentennial research and collections processing – that we have been working on during the summer. This post features a new permanent exhibit of materials in the Francis Thompson Room. 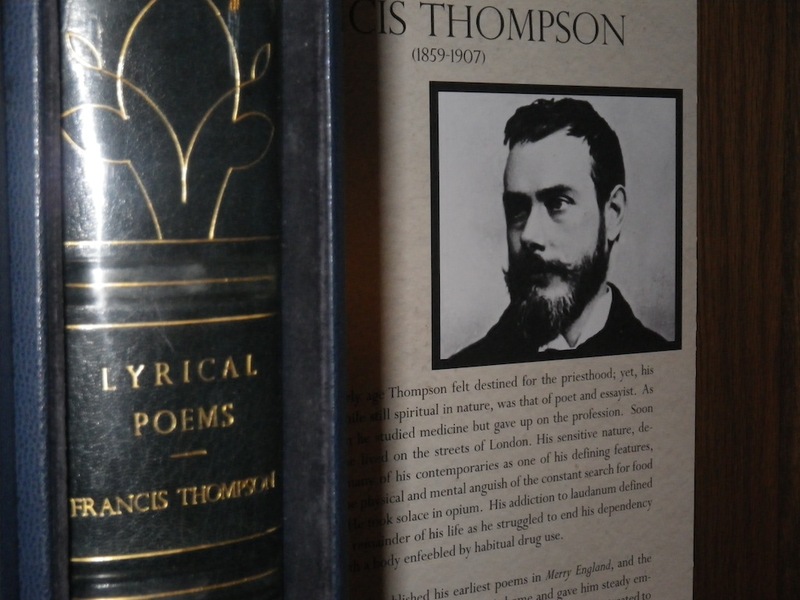 The John J. Burns Library possesses a large collection of manuscripts and books by or relating to British Catholic poet Francis Thompson (1859 – 1907). The January 1951 library newsletter, the Librarium, notes that, “During the past summer the Librarian accepted an invitation from the Meynell family to visit Greatham and to examine the Thompson manuscripts in the estate of the late Wilfrid Meynell, one of the chief benefactors of the Thompson Collection. After two weeks of cataloging, selecting, and consultation, practically all the manuscripts were purchased . . .” The librarian in question was Reverend Terence L. Connolly, S.J., who served as chair of the Boston College English Department and was also director of libraries from 1946 – 1959. Greatham, located in Sussex, England, was the country home of Thompson’s benefactors, Alice and Wilfrid Meynell. During this summer, the Thompson Room received some minor renovations aimed at introducing our patrons to some of the Burns Library’s founding collections. In addition to the Francis Thompson materials, Father Terence Connolly collected the works of British Catholic authors who were inspired and emboldened by the Oxford Movement. Connolly’s interest in Francis Thompson, the author of the well-known poem “The Hound of Heaven,” provided the impetus to amass the manuscripts, printed works, and criticism of Thompson and fellow writers Coventry Patmore (1823-1896), Alice Meynell (1847-1922), and her husband Wilfrid Meynell (1852-1948). The print collection housed upstairs in the Thompson Room contains hundreds of volumes by and about these Catholic intellectuals. Some books in the Francis Thompson Room. A permanent exhibit displaying books from these collections is open for public viewing in this room, and the accompanying texts seek to give visitors a brief biographical, literary, and bibliographic history of this important moment in British letters. Visit the Thompson Room during the Burns Library’s open hours or read more about the Thompson Collection in digitized issues of the Librarium. This entry was posted in Art at the Burns Library, B. C. History, Featured Collections & Books, Student Posts and tagged boston college francis thompson, british catholic authors burns library, burns blog francis thompson, connolly thompson collection, francis thompson, special collections francis thompson. Bookmark the permalink.